Social media has become such a deeply ingrained part of our everyday lives that many people are unaware of the implications their behavior on Facebook, Twitter, Instagram and other popular platforms can produce should they face criminal charges. Following, the Denver criminal defense lawyers at Wolf Law discuss how to navigate social media following an arrest, and we explore the legal doctrines that allow content posted on social media platforms to be used as evidence in a criminal case. Emotions often run high after an arrest, and it’s easy to get swept up by anger, fear and frustration. But sharing information about an arrest on social media can quickly complicate a defendant’s circumstances. If you’re facing criminal charges, posting to social media is generally a bad idea. Do not share details about your arrest or charges: This includes information about the arrest and others involved (e.g., police officers, victims, other individuals charged, witnesses, etc.). Avoid posting new content to social media: This includes all types of content such as blog posts, tweets, photos, location “check-ins,” comments, “likes” and shares. Do not delete old content in an effort to conceal evidence: For reasons we will discuss below, deleting old content is a futile attempt to burry evidence that can be easily unearthed. More specifically, deleting content could be interpreted as guilt or a red flag to further an investigation. Do not accept new friend requests or new connections on social media: Even with activated privacy settings, information shared with friends, subscribers or other social communities is not truly private. What’s more, if a cooperating witness exists within your social network, they can share information with law enforcement without consequence. Following an arrest, key social media platforms to avoid include Facebook, Twitter, YouTube, LinkedIn, Instagram, Snapchat, Reddit, blogs or any other platform similar in scope or purpose. The Fourth Amendment to the U.S. Constitution protects people’s right “to be sure in their persons, houses, papers, and effects, against unreasonable searches and seizures.” The expectation of privacy is critical in distinguishing a lawful police search and seizure from one that is not. Many people assume the things they post on social media enjoy the same protections—especially when privacy settings are activated. Unfortunately, this is not always the case. Government agencies—including law enforcement—use several tools to acquire evidence stored online, and it’s no secret they regularly monitor these platforms for incriminating evidence. Much of what is available on social media does not require a court order to access, and much can be gathered retroactively. According to a Google transparency report, government requests for user information through subpoenas, search warrants and other court orders have grown exponentially since 2009. The U.S. is responsible for about 40 percent of all requests. That said, much of what’s available on social media does not require a subpoena or court order to access. In fact, much evidence is gathered retroactively, which, in some cases, can be detrimental to a defense. If you think this sounds unfair, you’re not alone. In 2017, Facebook lost an appeal to block bulk search warrants in a New York disability fraud case, although attorneys for the company believed those warrants violated the constitutional rights of its users. Enacted in 1986, the Stored Communication Act (SCA) created some Fourth Amendment-like privacy protections for email and other digital communications stored online. However, the protections granted by the Fourth Amendment and the SCA have been narrowed in some cases by applying what is referred to as the “third-party doctrine,” a legal theory that maintains a person has no legitimate expectation of privacy if information is voluntarily handed over to third parties. But questions have been raised over whether this idea is still viable in the wake of major technological advancements, social changes, and recent court cases including Carpenter v. United States, in which the U.S. Supreme Court held that the government violated the Fourth Amendment by accessing historical cell-phone location records without a search warrant. Moreover, the courts have not made clear what a “reasonable” expectation of privacy is as it relates to social media. 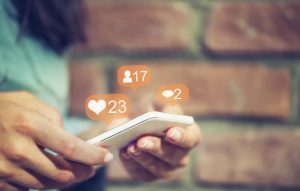 Until that happens, it’s best to avoid all social media platforms if you’re facing criminal charges; doing so could make all the difference in your defense.